Sony KD-65X9005A review | What Hi-Fi? So here it is, the Sony KD-65X9005A, or 4K TV for the masses, as Sony would lead us to believe. This £6000 65in TV is (until we get our hands on the £4000, 55in Sony KD-55X9005A) the smallest and cheapest 4K screen we’ve ever reviewed. We’re not new to 4K Ultra HD TVs, though, having spent some quality time with LG’s 84in 84LM960V and Sony’s similarly sized KD-84X9005 in recent months. First impressions were promising, but at £22,500 and £25,000 respectively, they’re only going to find homes with seriously big spenders. You could argue £6000 is still expensive by normal flatscreen TV standards, but the KD-65X9005A is no normal TV. For those playing 4K catch-up, now is probably a good time to give you a quick overview of the technology and where the land lies regarding content. By digital cinema standards, 4K resolution is officially 4096 x 2160 pixels – but in order for it to fit a domestic 16:9 picture format, the resolution is tweaked to 3840 x 2160. This is still four times the total number of pixels that you’ll see on a standard Full HD (1920 x 1080) television. It’s still a fledgling format. There’s no native content available to buy on a physical disc or download as a digital file. Sony is pushing the idea of ‘Mastered in 4K’ Blu-ray discs, eight of which Sony will be giving away when you purchase either the 65X9005A or its 55in sibling. But, although these will be made using a 4K scan of the original film, the resolution on the actual disc will still only be Full HD. No one broadcasts in it either, although companies in Japan plan to start in 2014, the BBC are planning to test 4K at Wimbledon and Japanese company NTT West recently announced it’s testing 4K TV streaming. TV programmes such as Breaking Bad have been filmed in 4K too, presumably for future consumption. Back in January at the Consumer Electronics Show (CES) in Las Vegas Sony announced plans for a 4K movie download service to be launched in the US this summer, though at the time of writing a firm date is yet to be confirmed. Also due to launch in the US this autumn is the $700 Sony FMP-X1 4K media server. It’s going to be loaded with 10 films, including titles such as The Amazing Spider-Man, Battle: Los Angeles and remastered versions of Taxi Driver and The Bridge on the River Kwai. You will also be able to download 4K films to the Sony Media Player's 2TB hard drive, with Sony confirming the launch of the Video Unlimited 4K download service in the US, with films from $7.99 to rent or $30 to buy. But while Sony’s service will presumably work fine with Sony 4K Ultra HD TVs, there’s still no official 4K specification, which could potentially become a stumbling block for early adopters. When these standards are finally introduced, be it next year, 2015 or beyond, there is a chance that the 4K TV you buy now might not conform to this new standard. Whether this could make first-generation sets such as these irrelevant remains to be seen, but we’d like to think that manufacturers as experienced as Sony wouldn’t let this happen. But with native 4K content unavailable to consumers, this Sony KD-65X9005A is going to have to cope with video from a wide range of sources, at a wide range of resolutions – including DVD (576i), Blu-ray (1080p) and HD TV (1080i). It also has to upscale all of these to match its own Ultra HD resolution. Watching standard definition Freeview is when you see this 4K TV working hardest. Here, the set has to do the most number crunching – it’s effectively guessing 19 out of every 20 pixels on the screen. And, to be fair, Sony’s X-Reality Pro picture engine copes with the task remarkably well, given a) the lowly resolution of the source material and b) the large screen size. The 65in X9005A does its best to keep noise and digital artefacts at bay and shows a good level of detail. Yes, there is a softness and a lack of sharpness, especially with some of the poorer quality channels, but this is to be expected. Otherwise, punchy whites and vibrant colours keep everything looking more than respectable. Switch to high-def channels on the Freeview HD tuner and the KD-65X9005A looks more at home. Clarity, detail and sharpness go up a level. The sharply dressed suits vying for Lord Sugar’s attention in The Apprentice are crisp, accurately drawn and full of texture and detail. A quick burst of tennis from the Queens Club shows the action handled with minimal judder as the players fling themselves around the court. (Sony’s Motionflow picture-processing tech is one of the most capable we’ve come across, and set to ‘Standard’ or ‘Clear’ should put you in good stead). This 4K TV also includes Sony’s new Triluminos picture technology, which is designed to produce a wider colour gamut and improved reds, greens and blues. They’re certainly vivid and there’s good differentiation between the tennis court’s grassy stripes. The blues of the background hoardings are pronounced too, but they do appear a little overcooked and unnatural in tone despite plenty of tweaking. Still, the players themselves, along with their rackets and clothing look clear and are generally free from artificial noise and shimmering edges. This 65in Sony 4K TV seems to relish the job of picking out smaller details such as the logos on the players’ hats. As you’d expect, there’s a similar jump in quality when you start with DVD and make the move up Blu-ray. Spin Les Misérables on the former, and the Sony tries its hardest to render lines and still picks out a decent amount of detail. But the stability, clarity and depth of image are all hindered by the resolution gap between source and screen. Watch the same film on Blu-ray and the difference is night and day. All the lines snap into place, characters and backgrounds become more focused and there’s much more detail for the viewer to feast on. Facial textures are much more obvious, and on-screen noise shrinks into the background. Les Mis’s dark scenes are a serious test for any TV’s black levels. Delve into the midst of the moody Paris slums and the KD-65X9005A shows promise, but it can’t call on the truly inky blacks you get from, say, the best big-screen plasma screens we’ve seen – such as the Panasonic TX-P55VT65B. Even with the backlight on a low setting it’s still there, glowing away ever so slightly in the background. On the plus side, the LED backlight is even and there’s no patchiness or unevenness, even at the extremities – which is a great achievement considering it’s a rather large edge-lit screen. You can attempt to go blacker and pick out more detail in the shadows by experimenting with a couple of the TV’s picture settings, such as Black Corrector and the Advanced Contrast Enhancer (we’d suggest using their lowest settings) but despite a couple of days trying different settings, we couldn’t quite reach the right balance of black detail and depth. When we reviewed the Full HD Sony KDL-55W905A, we were distracted by and had to take issue with the set’s particularly narrow viewing angle, but we’re pleased to report our fears weren’t realised on the 65X90005. You’ll need to be sitting at quite an obscene angle before you start losing image composure on this 4K screen. The TV comes with four pairs of passive 3D glasses. Actually, it comes with four pairs of frames and four pairs of lenses: you just have to snap the two together. One of the benefits of a 4K TV is that you can experience Full HD 3D resolution using passive 3D technology – the 4K set’s 2160-pixel horizontal resolution is halved into one 1080p picture for each eye. With Full HD screens, this is only possible with active-shutter glasses, which some people find tiring to use. And even though 3D won’t be on everyone’s wish-list, the KD-65X9005A really excels. The animated Despicable Me mixes a fine blend of subtle and more obvious 3D effects, and the Sony displays these extremely well. The set produces a beautifully defined image that’s easy on the eye; 3D effects don’t appear forced or fake. Motion is handled confidently, the layering of effects is nicely judged and there’s great depth to the picture. This Sony 4K TV's a real class act with this kind of 3D content. And now to the main event: the 4K image. In an ideal world, we’d be sitting down with our popcorn and viewing two-and-a-half hours of 4K film. But, in the absence of any commercially available content, Sony provided us with a server filled with a variety of 4K content, including an excerpt from the 2012 remake of Total Recall and a full-length trailer for the new Will Smith film, After Earth. In a word, wow! Feed the Sony KD-65X9005A resolution-matching 4K content and the picture stands head and shoulders over any Blu-ray equivalent. In fact, we found ourselves wondering just what the point is in 3D when 4K pictures are capable of producing such a sensational impression of depth and realism. Watch the After Earth clip and it’s almost as if you’re standing behind the camera on-set. The sense of depth given to the wide expansive shots of Earth’s landscapes is breathtaking, and the clarity and lack of noise allow the finest of details to be visible – from the flower buds on the foliage to the pores on Will Smith’s face. Textures look so real you could almost reach through the screen and touch the characters and their surrounding set – you’re wholly immersed in the action. Sony claims part of the benefit of 4K TV is that the extra resolution lets you sit closer to large screens such as this without seeing any gaps between the pixels. And, standing only 60cm or so from the panel, the pixels are so tightly packed that we had trouble picking them out. This distance is fine for 4K content but we wouldn’t recommend it when watching upscaled standard-def. Sony has gone to great lengths to make a statement with the KD-65X9005A, not just through the 4K Ultra HD technology, but also the design. We’re used to a TV market where speakers should be heard and not seen, hidden along the edges of screens with only a miniscule gap to fire through. Sony has gone completely the opposite way here, making the speakers on its new 4K TV one of the biggest standout features. On either side you can see twin drivers positioned either side of a single tweeter. The drivers use Sony’s magnetic fluid speaker technology, which originally made its debut on Sony’s BDV-N590 Blu-ray-in-a-box system in 2012, and lets the speaker assembly fit inside a much shallower speaker cabinet. Sony also says it helps produce a more open, accurate sound. It does the trick (and then some) but more on that shortly. The KD-65X9005A follows Sony’s new Sense of Quartz design philosophy, although the bezel doesn’t appear as strikingly blue or crystal-like as it does on the Sony KDL-55W905A. Having said that, this 65in beast is still slim enough to keep the style conscious happy, while the large circular chrome stand provides a stylish and solid foundation. In the middle, at the bottom of the screen, lies Sony’s Intelligent Core – instead of the whole logo lighting up, a small light beneath illuminates depending on the input you’re using. Even if 4K wasn’t part of the deal, the general spec of the screen would still be good. Wi-fi is included, and of the four HDMI inputs, two can accept a 4K signal. One of these is also MHL-enabled (Mobile High-Definition Link), so you can play video and audio through a compatible smartphone. The Sony has both Freeview HD and satellite options: the latter will give you Freesat channels, but they won’t be presented in the same manner as they would via a dedicated Freesat HD tuner. USB inputs let you record from the built-in tuners, too. We’ve already touched on the unique styling of the screen, in particular the presence of a pair of clearly visible integrated speakers. And while staring at the drivers and tweeters does take a little getting used to (as does the extra width they give to an already large set), they soon blend in to the rest of the package. In any case, there’s no doubt in our minds that the KD-65X9005A is the best-sounding large-screen 2013 TV we’ve heard so far – the speaker arrangement produces an impressive stereo image with separation, organisation, clarity and detail aplenty. The TV rumbles rather than explodes during explosive action sequences, but the bass you do get is controlled and punchy, and for a television speaker system the Sony sounds remarkably musical. A dedicated soundbar/wireless subwoofer combination will undoubtedly bring greater weight but it’s hardly a neater solution and the Sony is good enough to use without. We got along with the speakers just fine and found them really easy to live over long viewing periods. The set doesn’t sound tinny, bright or boxy unlike the majority of screens we’ve heard over the years. You’re given the obligatory handful of sound presets to try out, of course, including Cinema, Sports, Music and Game, but none sound as balanced or natural as the normal Standard setting. Sony should be applauded for such a bold approach to TV speaker design and other manufacturers should take note – perhaps this could be the start of a new trend? Sony's 4K TV comes with the same dual remote-control combination that comes with the company's higher-end TVs, including the W9 range. This means one large, standard-issue wand and another smaller one with NFC (Near Field Communication) connectivity – both in the Sense of Quartz design, of course. 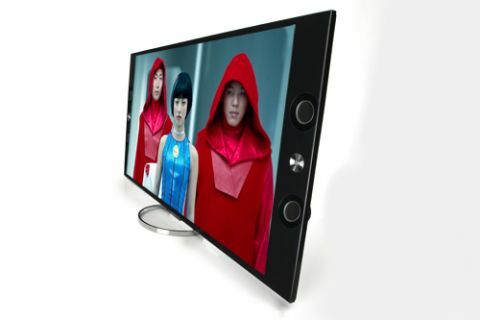 NFC lets you pair a compatible smartphone like the Sony Xperia Z with the television, mirroring content such as music and web pages on both devices. There are fewer buttons to navigate on the smaller remote which, combined with the Sony’s Fast Zapping feature (which brings up a channel guide and preview screen when you press the programme up button), makes for swift and effective operation. Sony has overhauled its smart functionality for 2013, so those familiar with older sets will notice that the Xross Media Bar, a bone of contention with some users, has now gone. In its place is a cleaner, more elegant and easier-to-navigate interface. Sony doesn’t complicate matters by opting for full voice or gesture controls. Hit the Home button on either remote and a list of menu options slides into view. You can access them and their sub-menus by a quick up/down/left/right press on the D-pad. The Sony’s dual-core processor then whisks you away to the relevant page. You’ll find all your apps over at the Sony Entertainment Network – these are accessed through the menu system or via the SEN button on both remotes. The usual suspects are all there, including BBC iPlayer, Netflix, YouTube, Facebook and Twitter, though prominence is given to Sony’s own streaming services – Video and Music Unlimited – which appear first at the top of the page. You can access all of these through the TV’s built-in wi-fi, but we’d recommend using the TV’s wired ethernet connection, especially if you’re going to be relying on a stable connection for movie or music streaming. Make no mistake, 4K content on this Sony TV looks stunning. But arguably – and surprisingly – the TV’s sound quality almost steals the show. The new speaker design must have been a big gamble, but it’s paid off and raises the sound bar (pardon the pun) for future TVs. In terms of picture performance the KD-65X9005A finds itself at a disadvantage. Its raison d’être is 4K, yet there is currently no consumable, native 4K content. The 4K clips that we’ve seen on this Sony 65in look spectacular and the content really can’t come soon enough – it isn’t unreasonable to assume that anyone who splashes out £6000 on this TV will want to experience 4K material straight away. We would. At the moment, the best you can do is feed it Blu-ray discs and HD TV. And, to its credit, the KD-65X9005A handles these lower resolutions well (if not flawlessly). This isn’t the best TV we’ve ever seen, but it’s certainly fit for 4K… whenever the format truly arrives.